Global retail design agency Sheridan&Co reveals its latest work in producing Anastasia Beverley Hills’ first ever UK retail concessions this month. The 38 sq./m ABH retail space at Selfridges in Oxford Street, London, which opens this month, is the biggest of its kind for the US brand. The launch is part of the brand’s wider global expansion plans to gain strong presence within European markets. 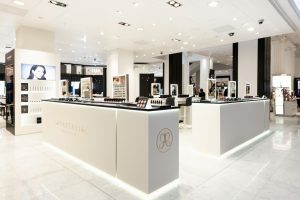 In June, Anastasia opened a 29 sq./m retail space at Selfridges Trafford Centre in Manchester. 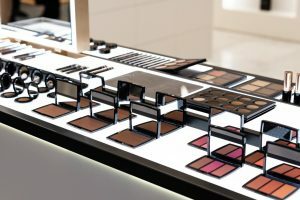 With an Instagram following of nearly 17 million followers, Anastasia Beverley Hills has grown to become a pioneering cosmetics brand, specifically in its relation to forging the perfect brow with its patented ‘Golden Ratio’ approach. It enlisted Sheridan&Co’s design team to work closely with Anastasia Soare’s team as well Claudia Soare, daughter of Anastasia Soare, who is president of the brand. Together they worked collectively to conceive, develop and install a retail concession tailored specifically to Selfridge’s clean and bright beauty hall environment, that would also make the brand stand out and elicit interaction with its products. Anastasia’s brand palette is predominantly black. However, with Selfridges’ beauty hall housing a number of beauty concessions also delineated in black, the design teams elected to create a retail space that subverted its usual sooty-hued aesthetic. Using a colour palette comprising ivory, rose gold and accents of matte black, the revised overall effect is still identifiably Anastasia in look and feel. The branding is executed in brushed rose gold with its elaborate brand mark embedded at the ends of each ivory coloured consultation counter. Accents of rose gold also frame the minimalist mirrors at each of the makeup stations. The products are rested on black matte counter tops, providing a striking and elegant contrast to the ivory. A further display plinth showcases enlarged images of the brand’s various colour palettes, and the concession’s walls are decorated by beauty shots of a model made-up with the brand’s iconic ‘polished’ look.